Your request will be denied. Heat Pipes quantity: 4. Fan Speed:2000RPM±10%. Type: Single Fan. - Bottom particular process and improve the efficiency of heat transfer. Air Flow:48CFM. - Checkered fins,tough style, larger heat transfer area. Otherwise shows no signs of use. My apologies for the inconvenience. 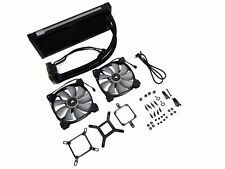 Cooler Master Red LED CPU Cooler Hyper 212 Air Top Cover Equipped Dual 120mm Fan. Condition is New. Shipped with USPS Priority Mail. AMD Wraith Spire Fan Heatsink Cooler for Ryzen AM4 CPU cooler. Condition is Used, no defects. Shipped with USPS Priority Mail. Includes Arctic silver unopened thermal compound (see picture). Selling due to purchase new case. Support LGA2011/1366/1156/775 i7 processors. Stronger cooling for overclocking or running cooler for longer life/greater stability. Large95mm fan for strong air flow under low noise operation. Durable Fan with special Z-AXIS BEARING. All tested working clean and more for older CPU's. FRU 60Y5494. SUB-FRU 60Y5493. Lenovo ThinkPad W510 15.6" Discrete graphics series laptop. thermal paste will be included with the fan. NH-D14 CPU cooler and works like new. Used for like a month and I cleared out the remaining dust. This cooler is very nice, one of the best air coolers out there and outperforms some water coolers. This will last you a very long time. Has a Kingwin 120mm radiator for the front and in between the towers there is the stock Noctua 140mm. Ball Bearing Fan with Heatpipe Heatsink. • Support (Thin) Mini-ITX type case and 1U server. Built on a set of dense aluminium fins in combination with two 6mm thick copper heat pipes and a Heat Direct Transfer core (HDT). The dual 120mm PWM Fans with red LEDs gives the best balance between airflow and static pressure to take the heat away. we also improved the universal bracket design to ensure easy and worry free installation on all platforms. If your CPU socket type isn't LGA 2011, we have otherCPU Coolers available. • Max processor heat disspation: 130W. 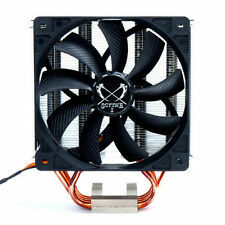 • 4-pin powered PWM function fan for a silent operation. DC Fan Size : 95mm x 25 mm. Bearing Type : Everlube Bearing Fan. Equipped with radial aluminum cooling fins and silent fan, this CPU cooler can centralize airflow and effectively enhance thermal dissipation. In addition, strengthen back holder of cooler to keep the motherboard from deforming. CLEAN USED STRAIGHT FINS Cooler Master Hyper 212 EVO MOUNTING BOLTS, BRACKETS, AND THE FAN THIS VERSION FITS AMD SOCKETS: 940,AM2,AM2 , AM3, AM3 ,FM1,FM2 Intel Socket: 1366 / 1156 / 1150 / 1155/ 1151/ 775/ 2011 GOOD FINS AND WILL BE PACKAGED TO ARRIVE IN THE SAME CONDITION FREE PRIORITY MAIL SHIPPING 2-3 DAY DELIVERY WITH TRACKING A $10 VALUE. Cooler Master Hyper L3 RR-LCH-P9E1 - processor cooler. Cooler Master Hyper L3. Processor Compatibility. LGA775 Socket. HEATSINK & FAN. Fan Height. 90 mm x 112 mm x 41 mm. Fan Bearing. Core™ i7 i7-920~i7-960. Stronger cooling for overclocking or running cooler for longer life/greater stability. SCE USA Universal CPU cooler. Core™ i7 i7-860~i7-870/i7-860S. 95mm CPU Fan cool. CPU Support. HP 644724-001 CPU Cooling Fan with Heatsink. Original HP Part#644724-001. Size: 50mm x 50mm x 10mm. Connector: 3 Pin motherboard style. Wire Length: 10". Noise: 28 dBa. Airflow: 9.3 cfm. Another new feature can be seen is the Kotetsu's new mounting system. The new Kotetsu also draws on the highly proven M.A.P.S. already having shown excellent results with the Mugen 3. Kotetsu CPU Cooler. AVC DV07020B12U 4-Pin (for AMD high performance cooler). Current: 0.7A. Bearing: Ball. Designed for HP Pavilion 510-a010, 510-a030a Desktop. Compatible HP Slimline 260-a011, 260-a111na, 260-a119na, 260-a131nf, W3A45EA 460-a001ns. PUSH PIN MOUNTING TYPE AVC Z9U740P009 LGA775 Cooler. AVC Aluminum/Copper Base CPU Heat Sink & Fan with Copper Pipes For Socket 775 Celeron D and Pentium 4 processors up to 3.8 GHz. Aluminum heat sink with Copper base. Intel original for Intel LGA 1366 Heatsink Cooler Fan CPU . Condition is New. Shipped with USPS Priority Mail. 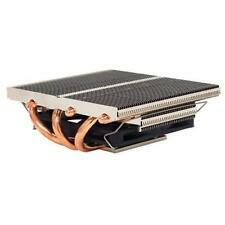 Cooler Master 775 Heat Sink heatsink C2Q C2D NEW!!!! X Dream P775 CPU Cooler [RR-LIE-L9E1-GP] -Low Profile LGA 775 Cooler for Small Chassis -Special Design for New Intel Duel Core 65W Conroe Family Processors -Cross Shaped Heatsink Design Here at Beckett's Trading Company I pride myself on having quality products and great customer service. I also believe in recycling. With that said, sometimes I will ship your products to you in boxes that may have other big name e-commerce logos on them. If that is not something you're interested in, please let me know when you place your order and I will happily ship your products to you in either a plain brown box or an official USPS box. Thank you for your business. CPU Socket GlideStream 120 PWM. Type: GlideStream 120 PWM. Speed: 400 Ã‚Â± 200 rpm to 1400 rpm Ã‚Â±10%. Newly Developed Mounting System. Mfr Part Number: SCKTT-1000. 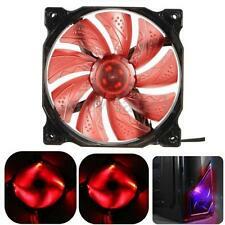 NEW RED EDITION 70MM FAN for AM3 High Performance Copper Core Heatsink. 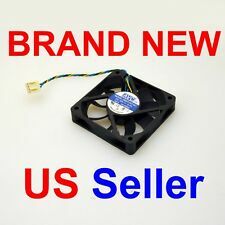 Evercool EC8010M12CA 80mm x 10mm Ball Bearing Fan w/ 3 Pin Connector NEW!!! EVERCOOL EC8010M12CA 80mm x 10mm 3 Pin Ball Bearing Fan. Model: EC8010M12CA. Size: 80mm x 80mm x 10mm. Bearing Type: Ball bearing. Connector: 3 Pin tach style connector. Fan Speed: 3000 RPM /- 15%. Lead Length: 10". AMD Wraith Spire and Wraith CPU Cooler Ryzen 5 2600x FX 6350 2 HEATSINKS! BOTH DO NOT HAVE LED LIGHTS. The Wraith Spire from the Ryzen 5 was used for about an hour and then removed. The thermal paste has been cleaned off. Support LGA2011 i7 processors. Stronger cooling for overclocking or running cooler for longer life/greater stability. SCE USA Universal CPU cooler. 95mm CPU Fan cool. Large95mm fan for strong air flow under low noise operation. Designed for the fallowing Socket: LGA 775 Processors: E8600, E8500, E8400, E8300, E8200 & E8190. There is NO Processor/CPU included with this sale. This has never been used or installed. Including CPU Heatsink/Fan, 2 x 4GB RAM, SATA DVD-RW drive, and SATA Optical Drive data/power cable pulled from HP Elite Ultra small Desktop (USDT) PCs. Works with HP Elite USDT 8000/8200/8300 series. It is the best fan to use withPUSH-N-SNAP Mounting Type LGA775 ONLY. • For Narrow ILM Only. Model Number: R14. • Convenient Heat Sink Captive Mounting. • Material: Copper 1100 Stacked Fins. • 6028 Side-Blow Fan with PWM Function. • Weight: 660g±10g. Designed for INSPIRON 3646 MINITOWER PC. 5mm Thicker Fan / High Performance / Quiet Heatsink's Fan Better Thermal Solution vs MF50101V1-Q030-S99. 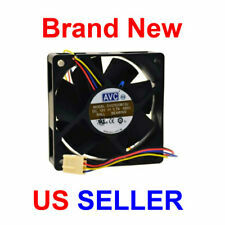 Evercool EC3010M12CA 30mm x 30mm x 10mm 12 Volt Ball Bearing Fan. Noise Level: <22 dBA. 3-Pin / 3-Wire. Bearing Type; Ball. Air Flow: 3.7 CFM. OCZ Technology 100mm 4pin. DELL 13G075135110DE CN-0NT270 CPU HEATSINK FAN 4pin 80mm. 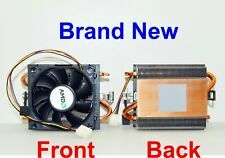 AVC Hi.10800.068 Socket Lga155x Heatsink and 4pin AVC Cooling Fan 4pin 90mm. DELL 13G075182010DE CN-0JY167 LGA775 4pin 80mm.